The San Carlos Country Club has an 18-hole golf course, a swimming pool for members or can be used for a fee plus a snack bar. The residential areas within the country club extend over a huge area, covering most of the north side of the main road as far north as the Ranchitos rural sector. In the Country Club area there are some very beautiful homes and gardens, both new and old. The golf club phone number is 622-226-1102. The Athletic Club on Calle IV in the Ranchitos has tennis courts as well as the San Carlos Plaza Hotel. Astrid’s Ranch (El Rancho del Desierto) offers guided trail, desert and beach horseback rides every day of the week, for all experience levels. They are located next to the Paradiso Hotel. 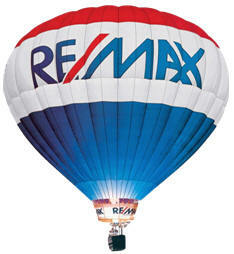 Stop by or call Astrid at 622-227-0267. To find the stables take the same road as you do to the Soggy Peso and veer to the right you will see the stables before you reach the end. Athletic Club, located on Calle IV which is at the far east end of the downtown area of San Carlos on the north side in the area known as the Ranchitos. They have a heated pool and offer aqua aerobics, Jazzercise, Pilates, Yoga, all with certified instructors. There is also a tennis court and a climbing wall. They have a Pro Shop, child care and also have a coffee/juice bar. Located about ¼ mile beyond Los Jitos Hotel, inside the Country Club gates, this big building is not much to look at, but a lot of enjoyable activities go on inside. It opens in November for regularly scheduled public events including once a month Friday night buffet diners, bingo, dancing classes, arts and crafts lessons, bridge and so forth. 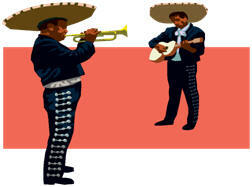 Membership fee is $150.00 pesos per year or $100.00 USD for a lifetime membership. Now that’s a bargain! The members of Club Deportivo constitute a quiet, but effective source of community service including music education of young people of San Carlos through a series of concerts. There is a strong tradition of volunteerism in this community. New members are very welcome. One of the most active and indispensable groups is the Rescate Auxiliary which provide all the funding for the rescue and emergency medical services in San Carlos. The Rescate Service of San Carlos Headquarters is on the Main street next to Remax, and responds to San Carlos emergency calls only. Rescate ambulances can take patients to hospitals in Hermosillo or arrange for air transportation. The DeCima Hospital in Hermosillo is recommended because of their high standards of care. You can also become a gold card holder. RESCATE Gold Club Memberships include urgent emergency clinical services at no further charge. This includes ambulance transportation from your home or location to the facility or to a local Guaymas treatment facility if indicated. Your participation in the program allows for the continuing operation of RESCATE and the acquisition of additional equipment, personnel and training. 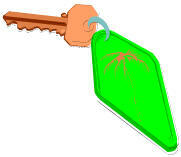 For more information call 622-226-0158. Another group that works tirelessly for the benefit of the animals in the community is the SBPA . Some groups work to improve the ecology of the estuary, the whales, fish and other animals of the Sea of Cortez. Community Service: Clean up groups and individuals do a lot to keep our streets and beaches clean. The police are a great help in this ongoing endeavor. I have never before lived in a place where the police are so helpful. The Rescate workers and supporters, the Bomberos (fire department), the Cruz Roja (Red Cross), and the police are aware of everything that’s going on, and keep the community safe. The San Carlos Art League meets regularly at the Tecalai Trailer Park clubhouse. They hold weekly meetings to explore some area of drawing or painting and from time to time offer workshops from visiting artists. Art supplies are nearly unobtainable here. Best to bring your own paper, canvases, and paints from the states. Art Shows are produced by the Belles Artes Galleria, and the Art League has two or three art shows each year for members. Calling the USA from Mexico: 001 + area code + telephone number. Calling Mexico: 011 + 52 + area code + phone number. 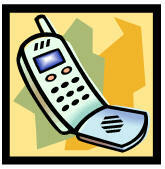 From Mexican cell to Mexican cell: Area code + phone number. The Guaymas-San Carlos telephone book does not give a complete and accurate listing of all the telephone numbers of individuals and businesses in San Carlos. The Rescate De San Carlos community directory is available at the Rescate building and at a number of local businesses. It is well worth the money and even includes e-mail address, boat names and local business phone numbers. Sign up for internet service at the Telmex office . The charges for this service will appear on your phone bill. Each time you access the internet, you are charged for one local call. High speed connection is a little more expensive, but it has real advantages: you can use your computer and your phone at the same time, and internet is much faster. If you do not have a phone, you can access the internet at several local cafes or businesses including Evie’s Simply Coffee, Gary’s Internet Service, and Barracuda Bob’s. X-Pro Computer Services offers wireless internet access on a subscription basis. Call 044 622 123-1781 for service. Be sure to check out Skype on your computer for computer to phone access. It is inexpensive and the voices come through very clear, even from Europe. Some people also use Vonage or Magic Jack. Froggy’s: The large palapa on main street, Blvd Beltrones. Live music, karaoke, TV, pool tables, and nice food menu. Watch out for deadly Margaritas. 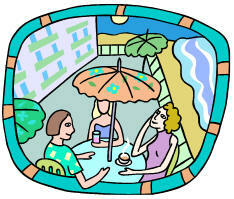 Tequila’s Restaurant Bar: Near Marina San Carlos very popular restaurant where people like to meet to have fun. The food is good, though not gourmet. I like their breakfasts, the carne asada plate, and fish tacos. Fridays you will find card players hanging out. Live music for entertainment. Charlie’s Rock: Known for fresh seafood, dine overlooking the Sea of Cortez under a large Palapa. Located across the street from the best Western on Blvd Beltrones. Club de Capitanes/Captains Club: Is half a block south of Marina Terra hotel, across the street. They have a light menu that includes hamburgers, BBQ beef sandwich, hot dogs, fish and shrimp tacos and quesadillas with shrimp, chicken, or chorizo. 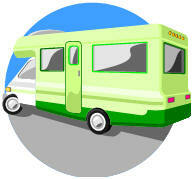 They are kid friendly and offer Wireless Internet access, a propane drop off service, purified water and ice. And you don't have to be a "Captain" - they are open to everyone. 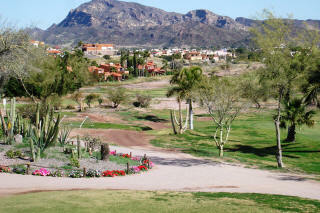 La Palapa: Is located to the west of the Posada Condominiums. This restaurant is like being in your own Corona Beer ad on TV! It is right on the beach and the food is delicious. Live music right on the beach. Trattoria: Fine Italian Restaurant in a casual setting. Dishes cooked fresh daily. Located on Blvd Beltrones across from Charlies Rock. Ruby Wine Bar: Located on the Malecon at the San Carlos Marina. This is a popular spot to hang out tasting a good selection of wine and munchies to share with your group. 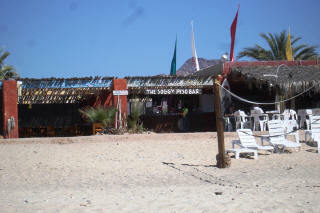 The Hangout /Soggy Peso Beach Bar: Live music and a beautiful ocean view, located right on Algodones beach. The view is gorgeous. The beach is very inviting, although it can get windy. The food and drinks are good the environment is even better! The best place to sit in the sun and enjoy yourself watching the beach activities. Located just before you reach the Paradiso Resort look for the sign. Blackie’s Restaurant Bar: Tucked away from the road next to the Pemex station on the north side of the street. Blackie’s is run by a family of restaurant professionals with a very well trained staff and an excellent chef. They have a varied menu and good wines. The food and service is consistently good, and you can entertain your visitors there and always be confident of a good experience. Enjoy candlelit dining in cozy rooms. Joey’s Bistro: Joey’s is located inside the San Carlos Plaza Hotel. Walk past the main floor restaurant, turn left and go toward the back. Joey’s has two other locations, one in Phoenix and one in Las Vegas. Their standards for food and service are high. The cuisine is Northern Italian with a nice selection of Italian wines. The Italian dishes are excellent and they also serve good steaks. Bonifacio’s Cotton Club Gourmet Restaurant & Beach Lounge: Is another one of San Carlos new fine dining restaurants. Located on the beach just south of the Paradiso Resort. Take the same road that leads to the Soggy Peso it’s the next building to the right. The food is great and the ambience even better. Come dressed up or dressed down everyone is welcome. The specialty is the Pork Tenderloin over Spinach and (ajo) garlic, mashed potatoes topped with mango piña chutney sauce, glazed with a white teriyaki salsa. An example of an appetizer: Tapas al pesto hoja Santa leaf wrap. To find out more about the menu, you gotta visit this place! You can eat inside or out in the beach lounge. Offering catering, event planning and weddings. ATVs and other all terrain vehicles can be rented from Off the Edge and at the Plaza San Carlos on the beach. 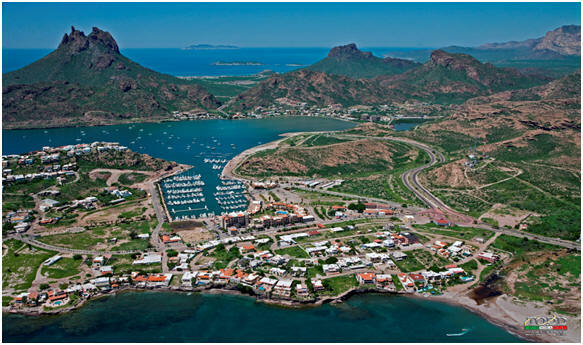 There are taxi stands at the Hotel MarinaTerra, Los Jitos and the Guaymas airport. Taxis are government-regulated, so the fares are reasonable. Some visitors use a taxi for tourist excursions. 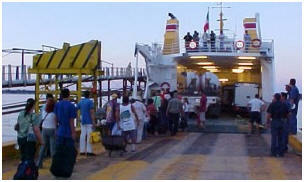 The Ferry Santa Rosalia transports both cars and passengers from Guaymas to Santa Rosalia, Baja California. Departures: Mondays, Tuesdays, Thursdays & Saturdays 8:00 p.m. Returning from Santa Rosalia to Guaymas on Tuesday and Wednesday at 9:00am and Friday and Sunday at 8:00pm.